NEW!... 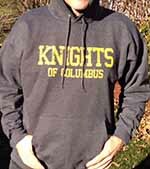 K of C- Hooded Sweatshirt...Made by Hanes 10oz.. Ultimate Cotton. Distressed Knights of Columbus Lettering. Please choose the size you wish to order.